Yummers. I'm not sure why these are Trader Joe's and not "Trader Ming's" like the orange chicken and some of their other Asian foods. I guess this is Americanized Chinese food. It tastes authentic enough to me...(as if I'd know the difference). Easy to prepare, good texture, not too expensive. I think they're $3. I'd say these are a good buy. Add a little soy sauce -or- TJ's has a really delicious gyoza sauce that works well with these little guys. I give them Four and a half out of Five Stars. Sonia gives Four and a half Stars. Bottom line: 9 out of 10. These are also delicious when added to TJ's low sodium chicken broth with about half a bag of torn spinach and a little bit of sesame oil! Um can you say YUM! Sara - sounds great! Sanda have made a soup with these, some veggie or chicken broth and some frozen veggie - quick, easy, and tasty! I love these! 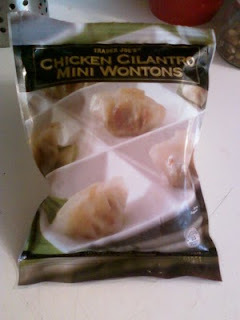 I use them in a mock-wonton soup, but mostly, I just fry up a handful to have with some basmati rice and broccoli. Delicious! My picky 13 month old loves these. I love them too! I steam a few with broccoli and whatever else is on hand. Very satisfying and Weight Watchers friendly-ish. I am hooked on these things!! I have them as a snack, have them as a side dish, and toss them in my salad sometimes. I will be adding them to soup once soup season comes back. Its too hot out. I cooked these in chicken broth with a splash of Trader Ming's Gyoza Dipping Sauce. Delish! I do weight watchers and these are only 1 point for 4! (Super low in calories and sugar). They are great.